Home » ... » Products » Engineering Plastics » Moderate <80° C » TIVAR® UHMW-PE Family of Products » TIVAR® H.O.T. Formulated to maintain key performance properties in an extended temperature range, TIVAR® H.O.T. will excel in a variety of industrial manufacturing environments where temperatures range up to 275° F, nearly 100 higher than competing UHMW-PE formulations. TIVAR® H.O.T. reduces the oxidization rate of the material at higher temperatures thereby slowing material degradation and extending wear-life in chemical, elevated temperature and thermo-cycling environments. In many applications, TIVAR® H.O.T. will last up to 10 times longer in higher temperature environments and has excellent wear and release characteristics. TIVAR® H.O.T. is white and available in the following standard sizes: 48" x 120" sheets with gauges ranging from 1/16" to 6" and 48" x 240" sheets with gauges ranging from 3/4" to 3". Other sizes are available on request. 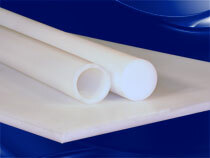 It can also be extruded in a variety of standard and custom profiles.